Download "Please use the following index links to quickly access the information you are looking for:"
2 Create a new My PHLY account: 1. 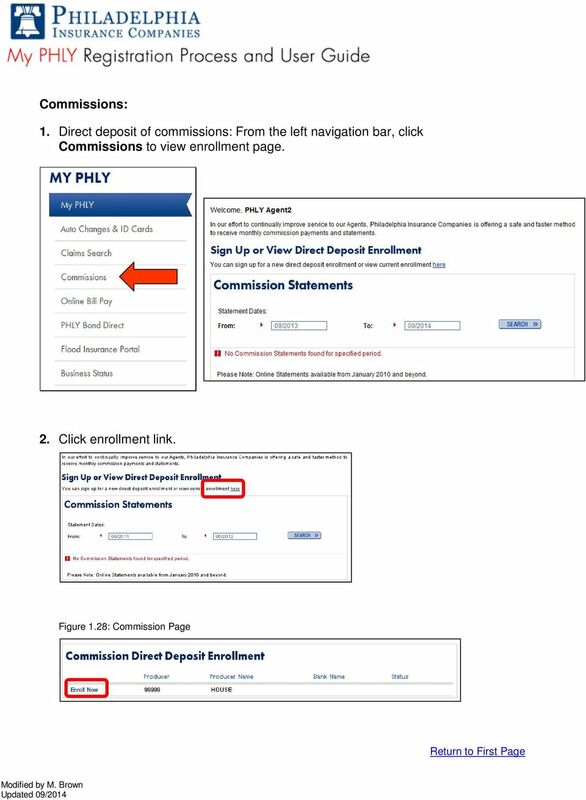 From the PHLY.com home page, and select one of the following methods to begin the registration process: 2. Access the Manage Your Account section and click Register 3. Or, click MY PHLY link at the top of the page. 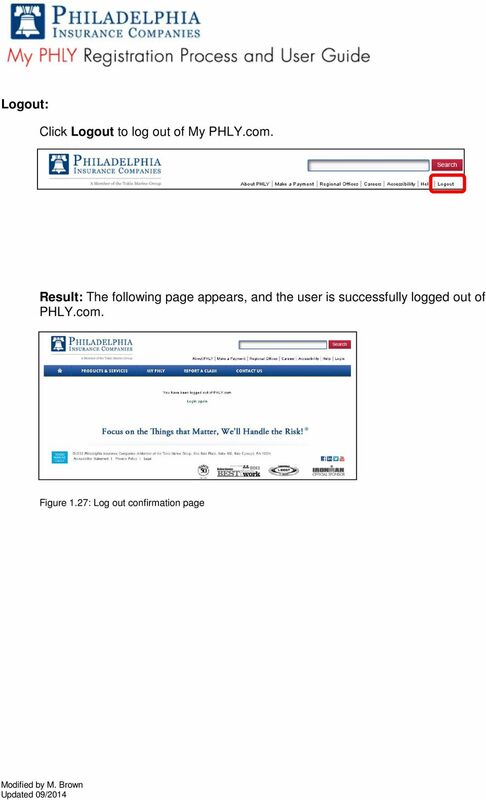 Result: The Login to PHLY.com page appears. o Click Create a new account. 3 4. 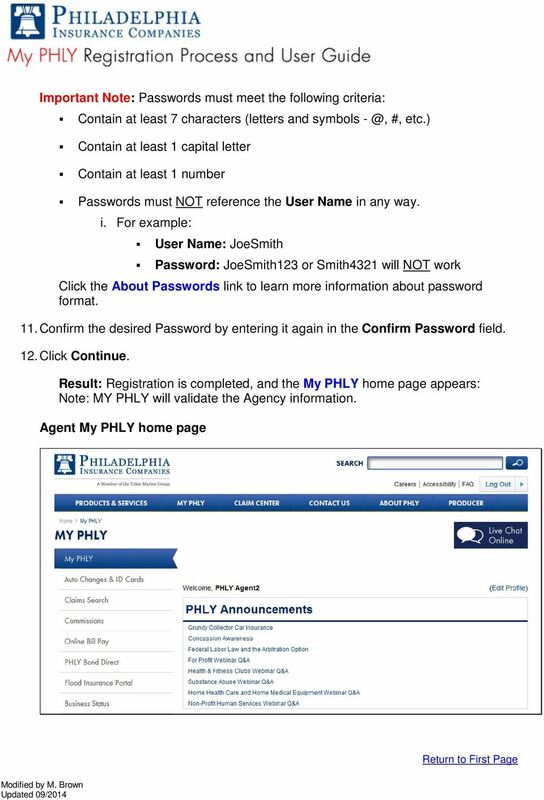 Result: The My PHLY Registration page appears. 5. Select the type of account being created by clicking the Producer radio button. 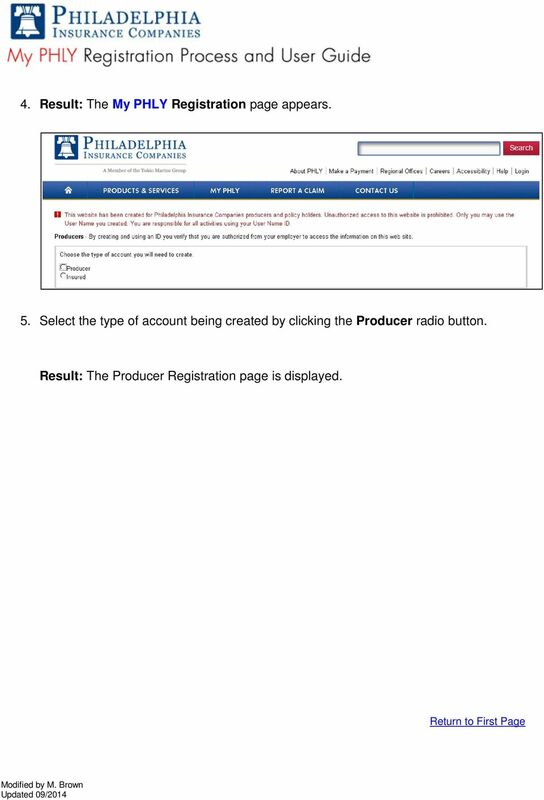 Result: The Producer Registration page is displayed. 4 Registration for Agents: 1. 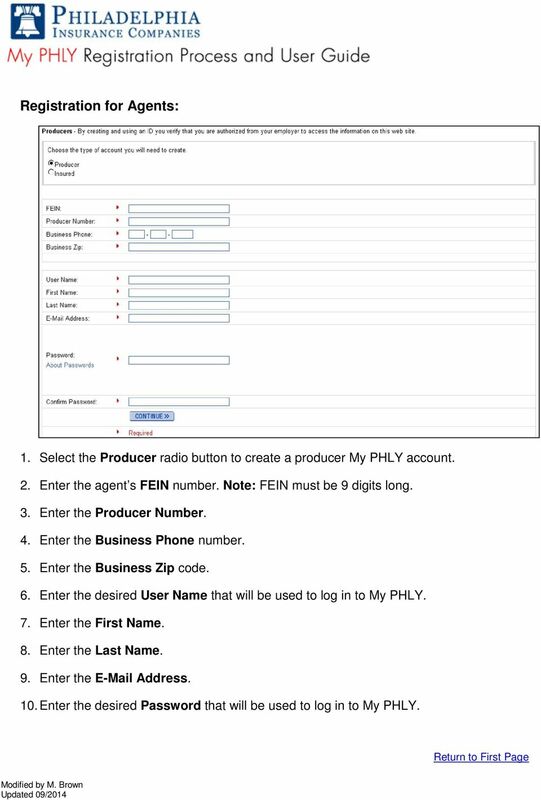 Select the Producer radio button to create a producer My PHLY account. 2. Enter the agent s FEIN number. Note: FEIN must be 9 digits long. 3. Enter the Producer Number. 4. Enter the Business Phone number. 5. Enter the Business Zip code. 6. Enter the desired User Name that will be used to log in to My PHLY. 7. Enter the First Name. 8. Enter the Last Name. 9. Enter the Address. 10. Enter the desired Password that will be used to log in to My PHLY. 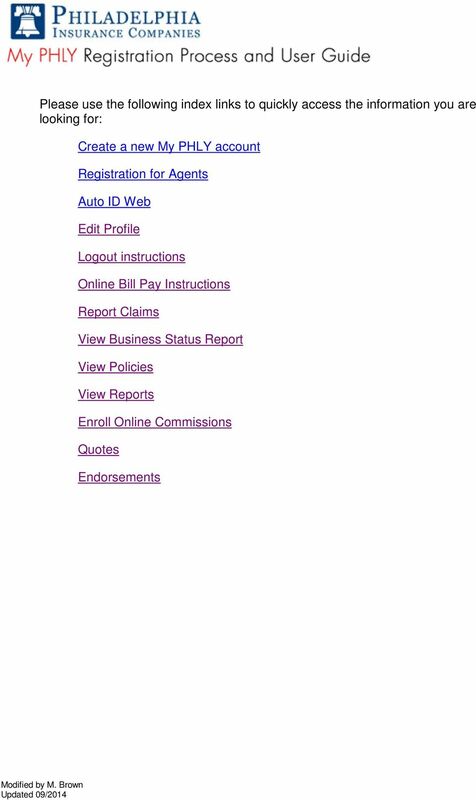 6 My PHLY home page Preferred Agent From the My PHLY home page, agents can view Auto ID cards, view and report claims, utilize Online Bill Pay, view Business Status, view and search Policies, edit their profile, and view various reports. 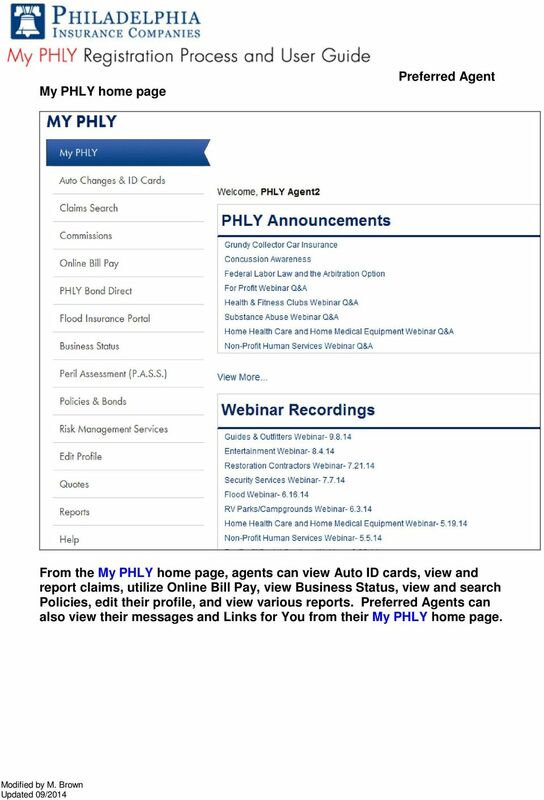 Preferred Agents can also view their messages and Links for You from their My PHLY home page. 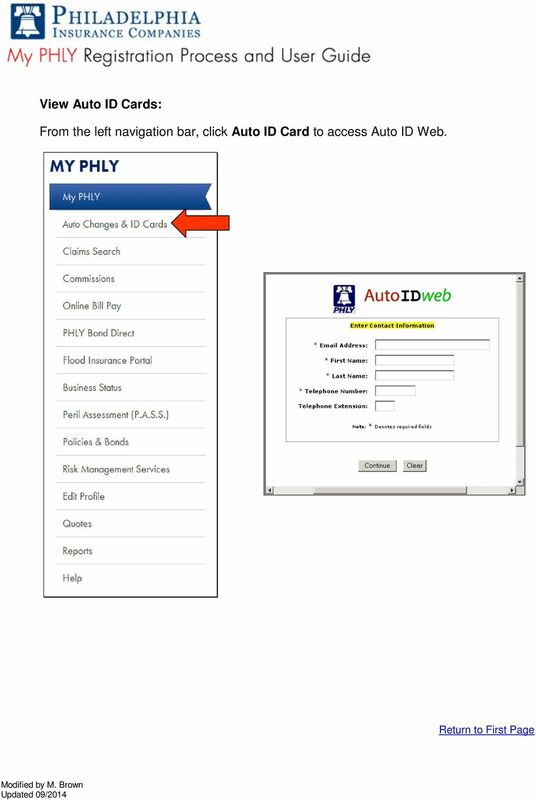 7 View Auto ID Cards: From the left navigation bar, click Auto ID Card to access Auto ID Web. 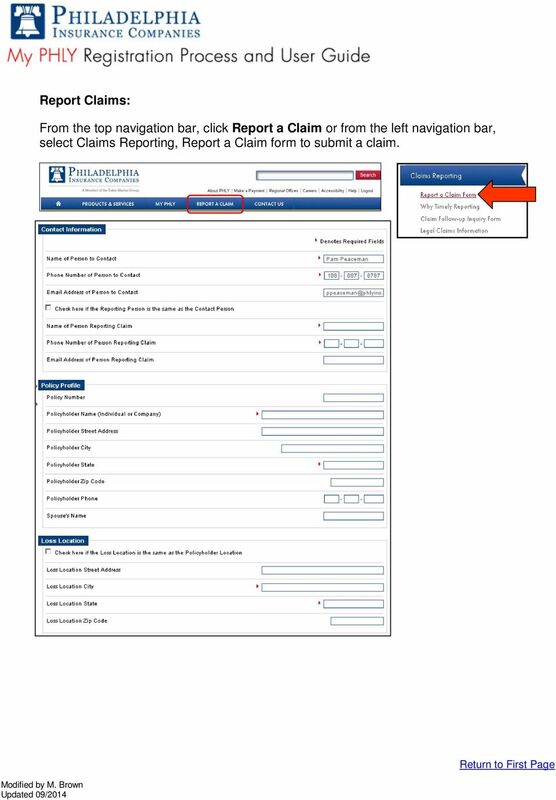 8 Report Claims: From the top navigation bar, click Report a Claim or from the left navigation bar, select Claims Reporting, Report a Claim form to submit a claim. 10 Use Online Bill Pay: From the left navigation bar, click Online Bill Pay to view current balance and pay bills online. 1. 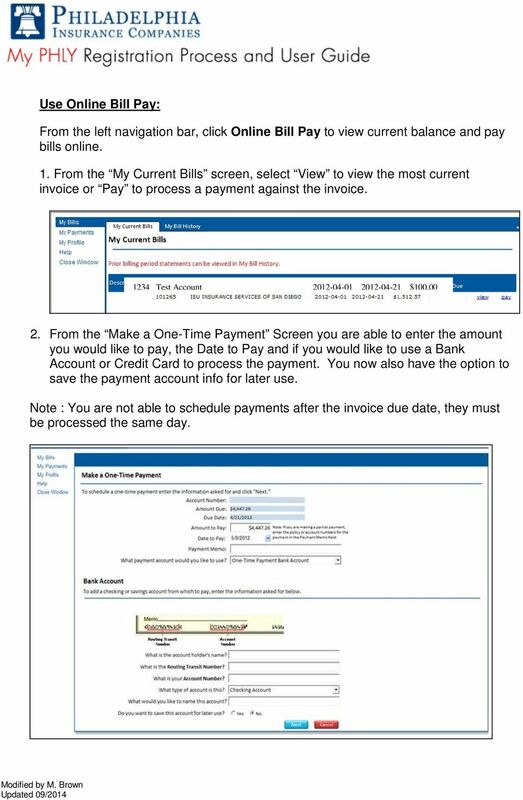 From the My Current Bills screen, select View to view the most current invoice or Pay to process a payment against the invoice Test Account $ From the Make a One-Time Payment Screen you are able to enter the amount you would like to pay, the Date to Pay and if you would like to use a Bank Account or Credit Card to process the payment. You now also have the option to save the payment account info for later use. Note : You are not able to schedule payments after the invoice due date, they must be processed the same day. 11 3. Once the payment information is entered you will be prompted to review and confirm the info entered. If everything is correct, accept the terms and conditions and click, Pay. 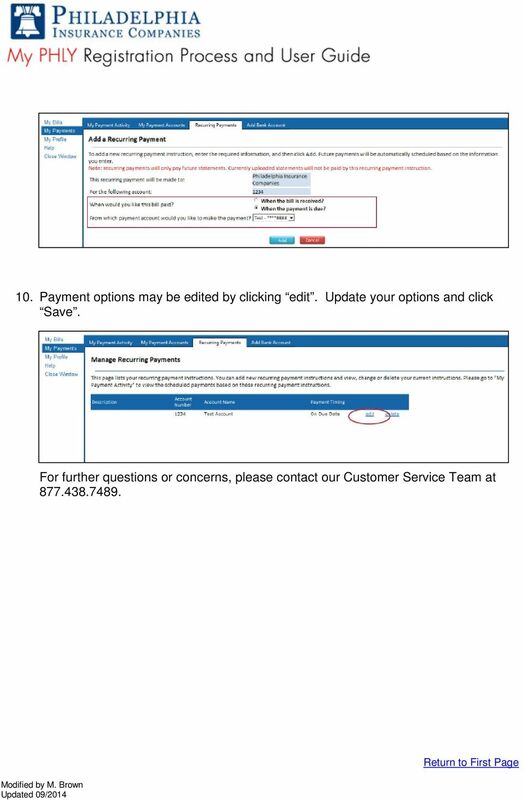 From the Confirm Payment screen you also have the option to go back and edit information or cancel the payment altogether. 4. 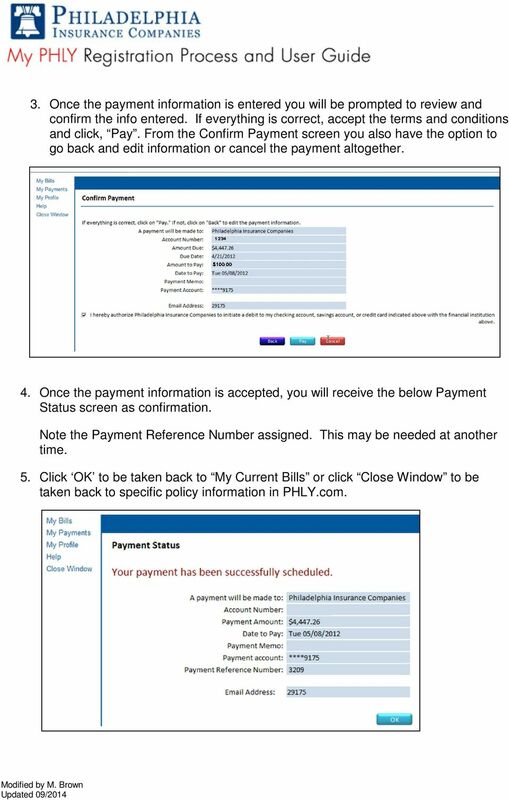 Once the payment information is accepted, you will receive the below Payment Status screen as confirmation. Note the Payment Reference Number assigned. This may be needed at another time. 5. 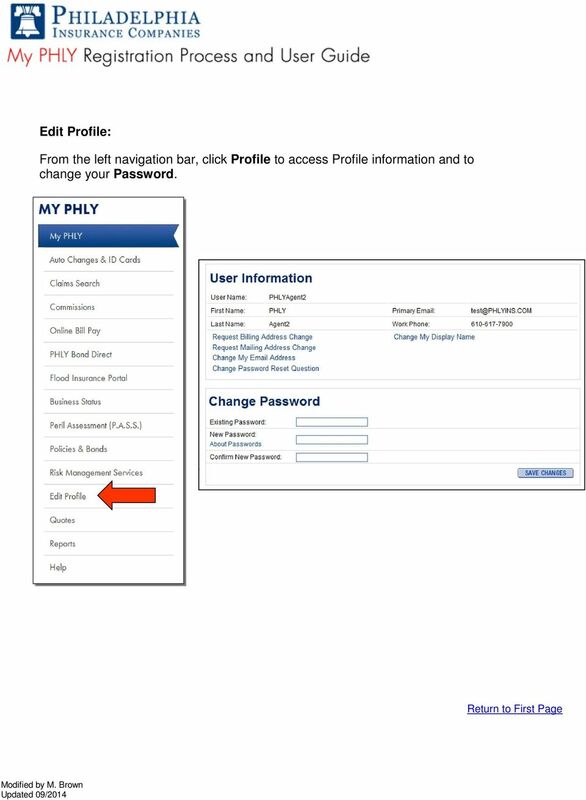 Click OK to be taken back to My Current Bills or click Close Window to be taken back to specific policy information in PHLY.com. 12 Enroll in Recurring Payments: 1. Login to PHLY.com 2. Click online Bill Pay under MY PHLY on the left side. A pop-up window will appear. 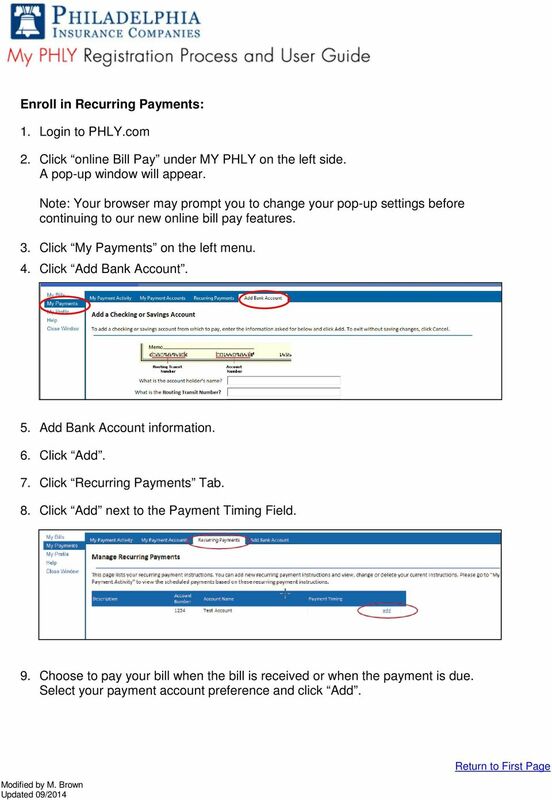 Note: Your browser may prompt you to change your pop-up settings before continuing to our new online bill pay features. 3. Click My Payments on the left menu. 4. Click Add Bank Account. 5. Add Bank Account information. 6. Click Add. 7. Click Recurring Payments Tab. 8. Click Add next to the Payment Timing Field. 9. Choose to pay your bill when the bill is received or when the payment is due. Select your payment account preference and click Add. 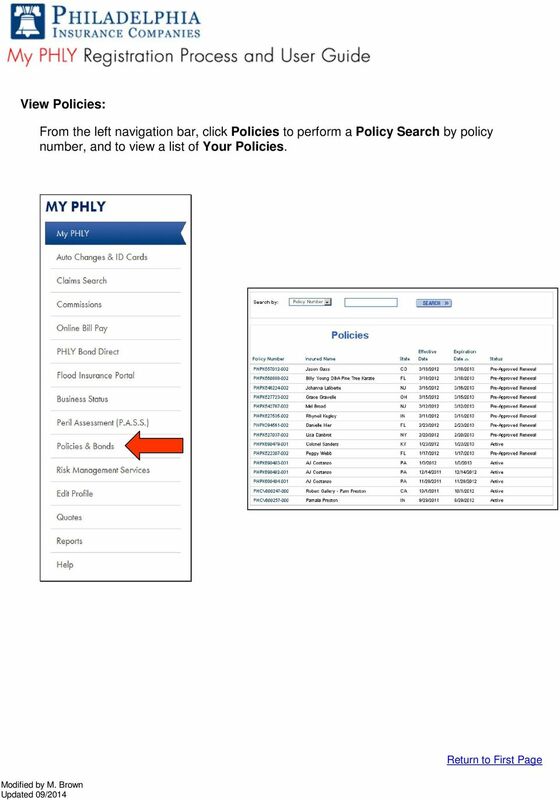 14 View Policies: From the left navigation bar, click Policies to perform a Policy Search by policy number, and to view a list of Your Policies. 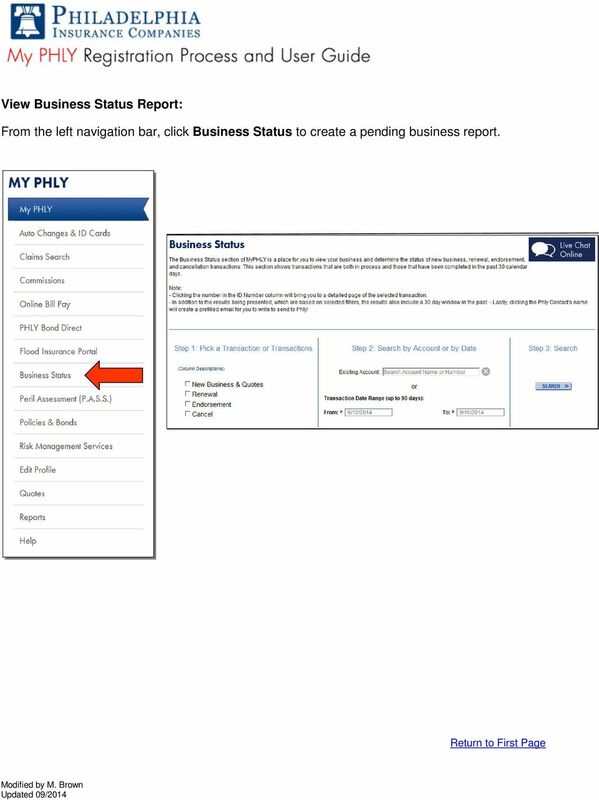 15 View Business Status Report: From the left navigation bar, click Business Status to create a pending business report. 16 Edit Profile: From the left navigation bar, click Profile to access Profile information and to change your Password. 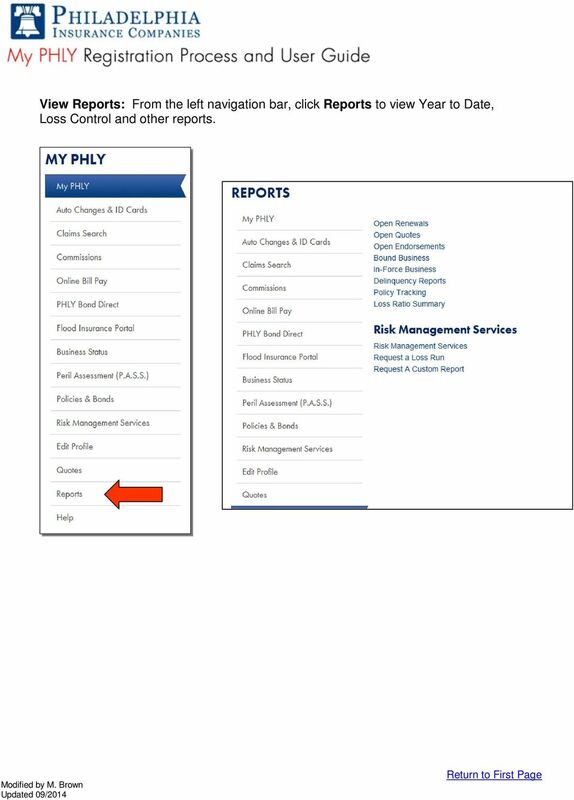 17 View Reports: From the left navigation bar, click Reports to view Year to Date, Loss Control and other reports. 20 3. 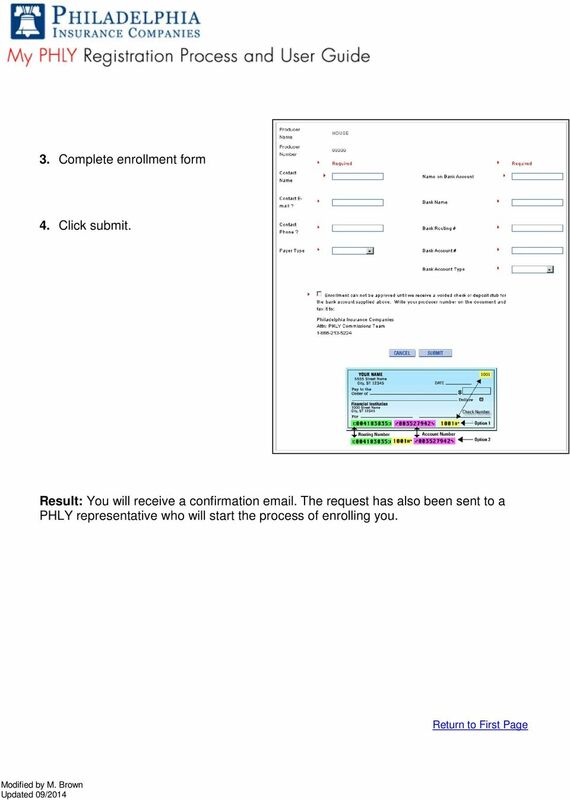 Complete enrollment form 4. Click submit. Result: You will receive a confirmation . The request has also been sent to a PHLY representative who will start the process of enrolling you. 21 Quotes: Online quotes are available for Special Events, Grundy Collector Car Insurance, Fitness trainers, yoga studios and more. 1. From the left navigation bar, click Quotes. Figure 1.29: Quotes 2. Click the requested quote on left navigation bar to access the product application. 3. Complete the application and click continue. Result: When the submission is complete, you will receive a confirmation . A PHLY representative will contact you to discuss the quote. 22 Endorsements: Agents can endorse multiple policies associated with the same account number all at once, attach documents to the endorsement request, for example, an Acord. Your endorsement request is immediately delivered to the appropriate underwriter reducing processing time. 1. Log into your Phly.com account. 2. Go to Policies & Bonds and click the policy number you wish to endorse. 23 3. Click the ENDORSE POLICY button. 4. Fill out the endorsement form. 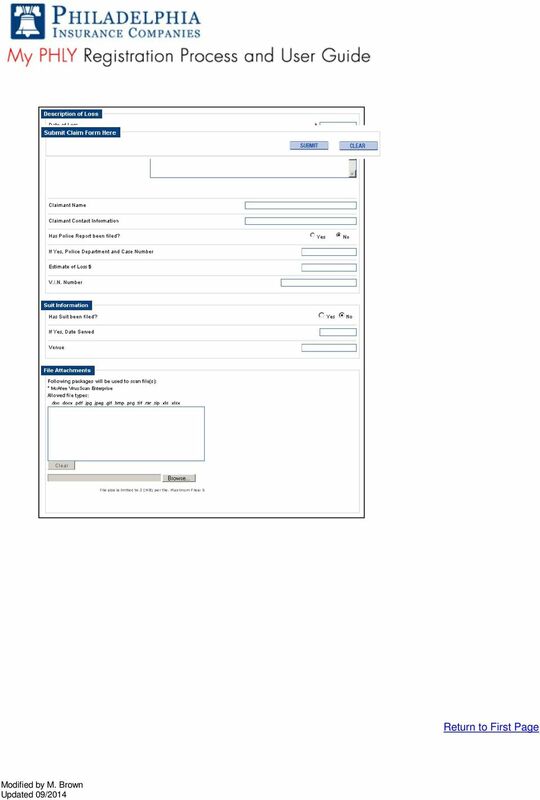 Select the Type of Change dropdown option Enter the required information as prompted Example: Mailing Address Change 5. Submit the application. 24 Result: You will receive a confirmation and your endorsement will be submitted directly to our internal system. Create a new My PHLY account: 1. 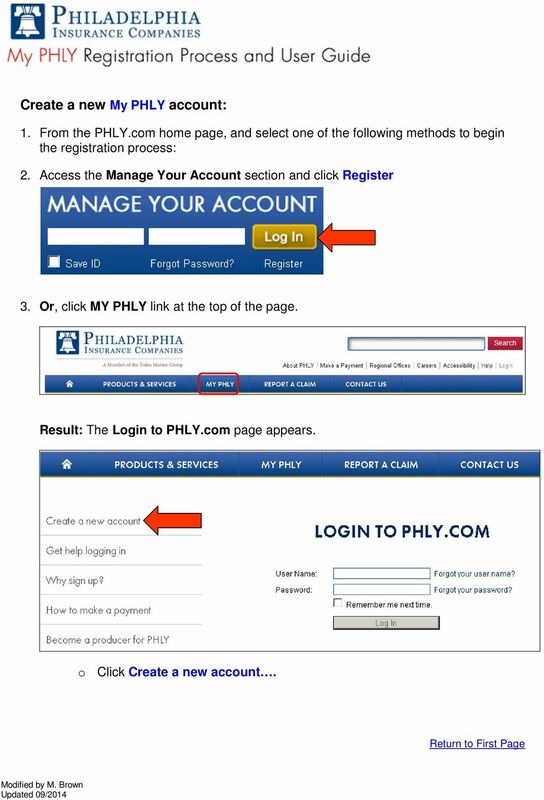 From the PHLY.com home page, and select one of the following methods to begin the registration process: 2. Access the Manage Your Account section and click Register 3.